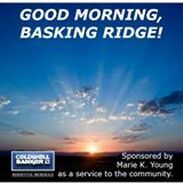 Telephone Numbers, Addresses, links to Utilities, Weather, Traffic, Schools, Transit Centric to Basking Ridge Area - THINKING OF MOVING? THINK YOUNG! Getting around the Basking Ridge, Bernardsville, Bedminster, and Bridgewater and Somerset Hills areas is actually quite easy. The towns are serviced by bus, train, major highways, and thoroughfares.